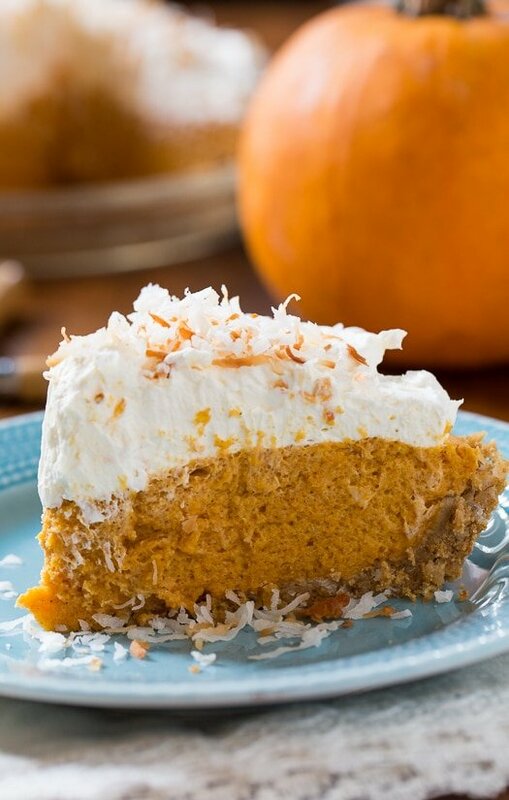 A no bake, light and airy Coconut Pumpkin Chiffon Pie served chilled and topped with a rich and decadent mascarpone whipped cream is a welcome change from plain old pumpkin pie. This is the first time I’ve ever combined pumpkin and coconut in a dessert. What a delicious combination! And pumpkin pie is a dessert that should be enjoyed more than just one day a year. 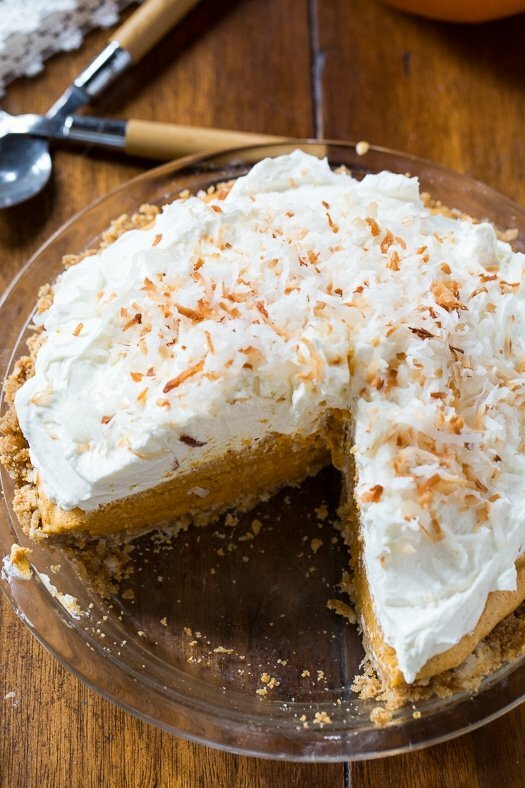 The no-bake crust for this Coconut Pumpkin Chiffon Pie is a delicious mixture of graham cracker crumbs and toasted coconut. The chiffon filling is made with gelatin, egg yolks, milk, fall spices and sugar. It’s cooked on the stovetop until creamy and thick. Once chilled, beaten egg whites are folded into it to create a light and luscious filling. The egg whites are not cooked at all so it’s important to look for pasteurized eggs at your store. I topped the pie with my favorite mascarpone whipped cream. Not only does the mascarpone cheese make it super thick and creamy, but it helps stabilize the cream too. It will stay thick and creamy for days. If you can’t find mascarpone cheese or don’t want to shell out the money for it (so worth it for a special occasion though) you can just double the amount of cream in the whipped topping. Since fresh whipped cream tends to lose it’s airiness and get a little runny over time, you may want to make the whipped cream pretty close to serving time. If you add in the mascarpone, you can make it in advance without any issues. Sprinkle some toasted coconut on top and you have a beautiful, delicious fall dessert. A no bake pumpkin dessert flavored with coconut and fall spices. A rich and creamy mascarpone whipped cream makes this a truly decadent dessert. Preheat oven to 350 degrees. Place coconut on a baking sheet, and place in oven to toast for 8 to 10 minutes, stirring halfway through. In a medium bowl, mix together 1 cup coconut, graham cracker crumbs, melted butter, and 1 tablespoon sugar. Press mixture into a 10-inch pie plate and refrigerate. Note: You can also use a 9-inch plate. The filling will just be piled higher. In a 3-quart saucepan, whisk together milk and gelatin. Let stand 1 minute. Cook over medium heat, stirring continuously, 1 minute or until gelatin dissolves. Stir in pumpkin, salt, cinnamon, nutmeg, ginger, egg yolks, and 1/2 cup sugar. Cook and stir mixture for 5 to 7 minutes. Do not let boil. Turn heat down if it starts to bubble. Pour mixture into a bowl and refrigerate for 40 minutes, stirring halfway through. About 15 minutes before the 40 minutes is up, beat egg whites at high speed with a whisk attachment until soft peaks form, about 8 to 10 minutes. Slowly add 1/4 cup sugar to egg whites and beat until stiff peaks form, about 2 to 3 minutes. Add 1/3 of egg white mixture into pumpkin mixture and fold in using a rubber spatula. Fold in another third and then the remaining egg whites. Pour into crust and chill 2 hours. Beat mascarpone cream and heavy whipping cream until soft peaks form. Gradually add sugar and vanilla and beat until mixture is stiff. Spread on top of pie. Sprinkle with remaining coconut and serve. Store leftovers in refrigerator. You can toast the coconut in a nonstick skillet instead of the oven. Instead of using the mascarpone in the whipped topping, you can double the heavy cream. Eggs are easier to separate when they are cold, but egg whites whip better at room temperature. Separate the eggs just after removing from the refrigerator and let the egg whites sit on the counter for about 15-20 minutes before beating. Not much longer though since the egg whites are not going to be cooked. Another Thanksgiving favorite is this Crock Pot Pecan Pie! This entry was posted in Desserts, Pies and Tarts and tagged coconut, pie, pumpkin. Bookmark the permalink. 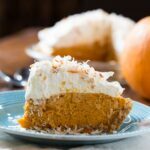 Can coconut milk be substituted for whole milk in the pie filling? Just checking–because I really don’t know. Is there a concern about serving a pie with raw egg whites? Also, how far in advance can you make this pie. It sound delicious! Thank you! Since the eggs are not cooked, I would use pasteurized eggs. They cost more but you don’t have to worry about bacteria being in them. I’ve been making this same pie for Thanksgiving since 1982 (minus the marscapone)! It’s absolutely delicious and a big, big hit. Everyone complains when I suggest making something different. It was really good and easy to make! Is there anyway to make this pie without eggs? I made this pie last year and loved it but now our daughter has an egg allergy. Stephanie-I don’t really have much experience baking without eggs so I don’t know what advice to give you. Sorry!! Hope you are able to figure something out. It was a really good pie. You might want to reconsider keeping the daughter. Try a little yogurt and canola oil, half and half counting each egg as a quarter cup of this mixture. Wowzer! What an inspired idea. I never seen this version of a pumpkin pie. I love it!!! this is gorgeous. my family would love it! Oh my this looks delicious, I love pumpkin pie and this is a great creative twist on the classic. These looks so much better than a traditional pumpkin pie! Love the mascarpone whipped cream! Wow, this pie looks so impressive! With pumpkin being so standard these days, it’s definitely fun to mix it up and make something different for the holidays!! I love this!! I love that this is a no bake version! With everything we need to get done on Thanksgiving, it’s nice to have a dessert that doesn’t add to the stress. 😀 Looks awesome, Christin! It’s the same way at our house – I have to make my pecan pie bars (otherwise there would be a mutiny!) and then I like to try something new. Love this with the pumpkin and coconut – I’ve never combined those two together before! This pie is what my dreams are made off – and LURRRVE that it’s no bake! I’m kinda loving that we BOTH did pumpkin pie today!! Great minds think alike for sure. 🙂 I’m kinda in LOVE with how high and thick these slices are and that fluffy frosting on top is literally killing me! Pinned. I love that pumpkin layer, it looks creamy, but fluffy! Yummy! I LOVE trying new desserts for the holidays. I always have some repetition, but also like some change. What a completely delicious looking pie! Wow that mile high slice is calling my name! Love that it’s no bake one less thing to worry about sticking in the oven on holidays! Pinned! This is one beautiful pie that I would love a slice of! 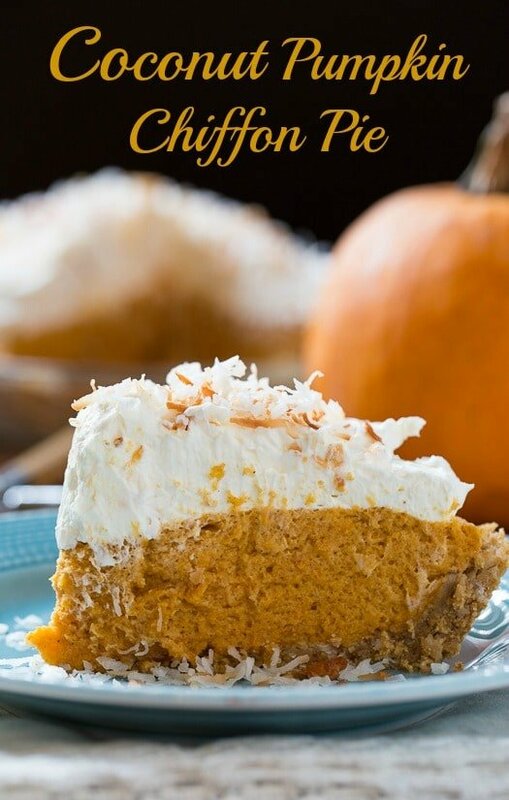 I love this twist on pumpkin pie, Christin! 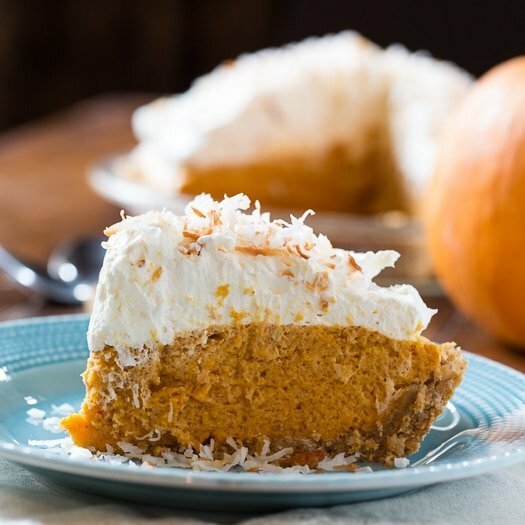 The coconut flavor sounds like it pairs perfectly with the pumpkin. And the mascarpone whipped cream looks like the perfect touch!